When I got married, my husband's brother's girlfriend gave me a beautiful necklace with a glass heart pendant. I loved it! If you could wear out necklaces from overuse, I would have, because I wore it all the time! Now it's their turn to get married, and they've chosen red and blue as their wedding colors. 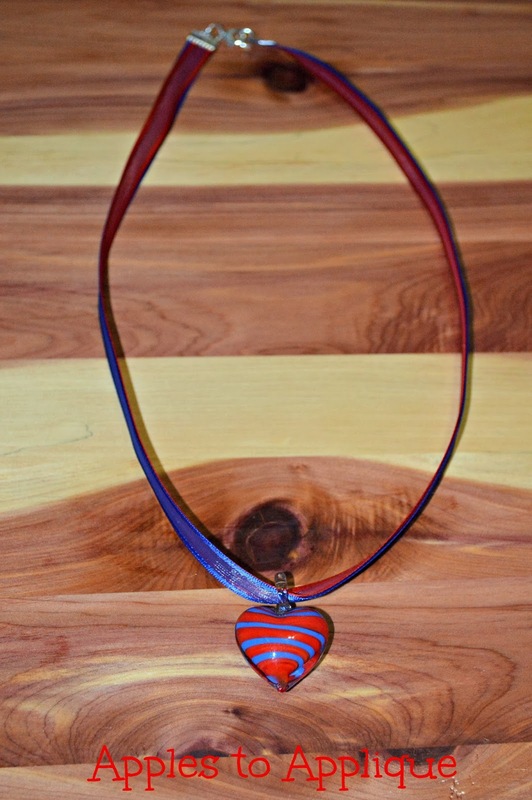 I was shopping recently and found a red and blue glass heart pendant, so I knew I had to make it into a necklace for my soon-to-be sister-in-law! The necklace she gave me has a ribbon instead of a chain or beads, and I love the way it looks, so I decided to go that route, as well. I had never worked with ribbon clamps or anything, but how hard could it be? As it turns out, making a ribbon necklace is so quick and easy it's almost embarrassing--you can be done in 15 minutes or less, start to finish. Give it a try! Start by cutting the ribbon(s) to your desired necklace length. If you aren't sure how long you would like your necklace, here is a great visual by Alena's Originals. 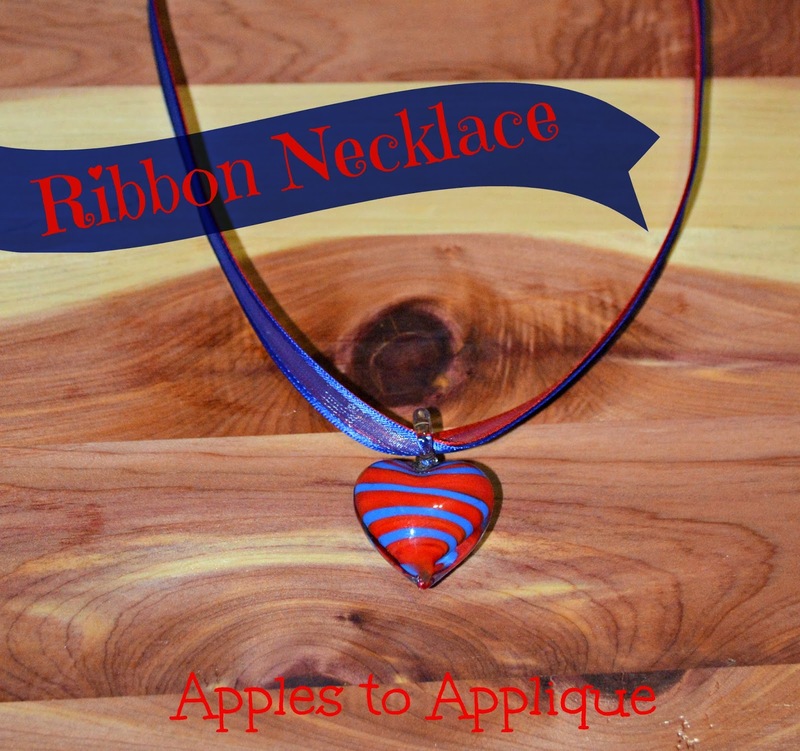 Slide your pendant onto the ribbon(s). Carefully use a lighter to seal the ends of the ribbon, or put a little clear nail polish on the ends. Slide the ribbon end into the ribbon clamp, all the way to the back. If you are using two ribbons, simply stack them. If you want, you can add a dab of glue in there to help hold everything in place. Use your needlenose pliers to press the ribbon clamp shut. With this type of clamp, the teeth with still be visible, but it should be secure. Give the ribbon a little tug to make sure. If any part of it feels loose, use the pliers to clamp it a little tighter. Repeat with the other end of the ribbon. If you are using two ribbons, make sure they are not twisted before you put the second clamp on. Next you are going to add your clasp. Use the pliers to open the jump rings. Slide one of the jump rings through the hole on the clasp. Thread the jump ring through the hole on the ribbon crimp to add the clasp to the necklace. Close it nice and tight with the pliers. Thread the second jump ring through the hole on the other ribbon crimp and close it tightly, as well. Don't you love the professional look these ribbon crimps lend to the necklace? That's all there is to it! You've created a one-of-a-kind piece of jewelry and it's ready to show off! Linking up with Take-A-Look Tuesday, the Wednesday Roundup, and Worthwhile Wednesdays. That is really pretty and super simple! I've always wanted to try making jewelry of some sort but haven't taken the plunge yet. I was surprised at how easy it was! It would make a good first project to delve into jewelry making.